Why don’t you have separate sick and well waiting rooms? Written by Suzanne Berman MD. Dr. Berman is a practicing general pediatrician in rural Tennessee. We’re occasionally asked by families why we don’t have separate waiting rooms for sick and well patients. It’s a good question, especially given that many pediatric offices are designed this way. There are several reasons why we chose not to do this. What ‘s a “sick” visit vs. a “well” visit? The first problem is one of definition. While some kids are very clearly sick and other kids are clearly well, many of the visits we do don’t fit nearly into one category or another. Is a depressed teenager “sick” or “well” ? What about a 4 year old with a possible urinary tract infection? An infant who’s not gaining weight? An 8-year-old with belly pain? 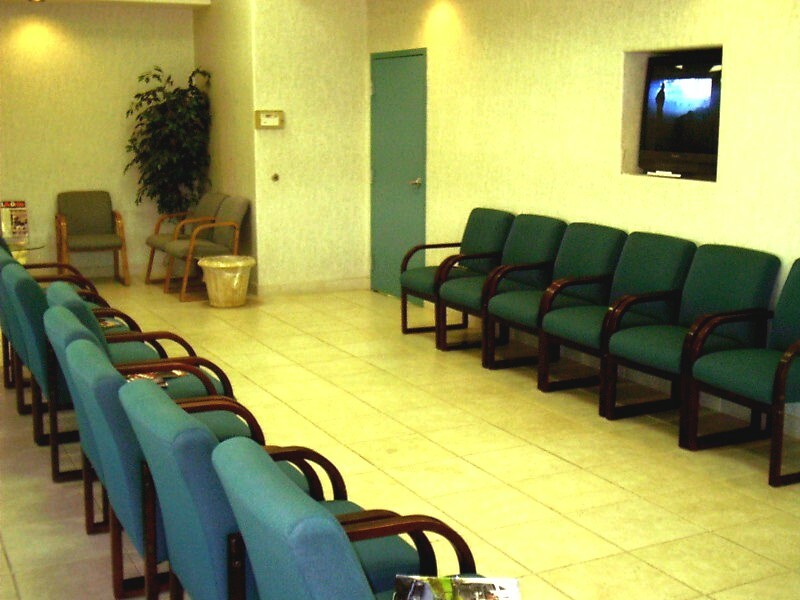 A better way to separate the waiting rooms would be a “contagious” waiting room and a “noncontagious” waiting room. Parents often don’t know whether a child is contagious or not when they check in. We don’t expect them to be – that’s our job. If a child comes in with a new rash, it might be eczema (not contagious at all), chickenpox (very contagious), or ringworm (only very mildly contagious, and certainly not enough to keep them out of school or sports.) Fifth disease is contagious and causes a rash – but once the rash appears, the child is no longer contagious. Knowing whether the child is contagious (and how contagious, and for how long) first requires a medical evaluation – and that happens after the child has been brought back, not in the waiting room. We often see double or triple appointments in a family. If Dad brings in a 6-month-old baby for a checkup (a well visit) and his two year old sister for a cough (a sick visit), what side of the waiting room should the whole family sit on? We could put the well baby on the sick side (since he’s already been exposed to the two year old’s illness, presumably), or we could put the sick child on the well side (to keep the well baby well.) There’s no good answer. And I can’t put a number on the times I’ve seen a well child who was accompanied by a parent who was coughing and sneezing uncontrollably. It actually can make crowding in the waiting room worse. Our office’s single large waiting area measures about 20 x 30 feet. Let’s say we divided it in half, to create separate sick and well waiting areas, each about 20 x 15 feet. In the summer, when 70 percent or more of our visits are “well,” our patients would be crammed in a much smaller room while our “sick room” would be underutilized. The exact opposite would be true in the winter months –a crowded waiting room of sick children half as big as it could be. 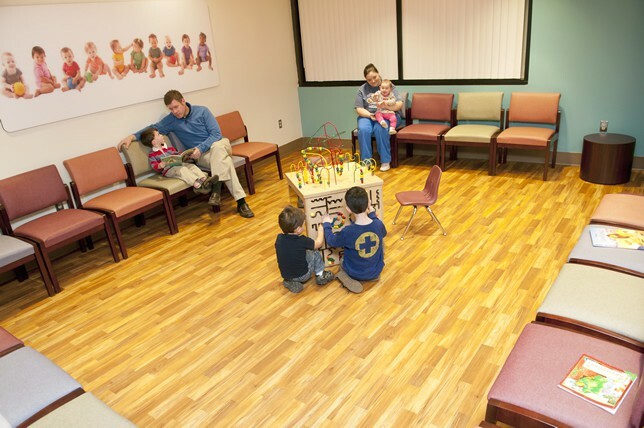 When we have a single large area, we can make the most of our space; families can sit wherever they wish, near or far away from anyone else in the waiting room. Parents are sometimes not honest about their child’s contagious condition. I once reviewed a malpractice case in which the plaintiff contended that the defendant pediatrician didn’t recognize a baby’s sickness. The defendant’s attorney asked the plaintiff’s grandmother (who had brought the baby to the office) whether the grandmother chose the sick or well side. Honest parents will admit that they’re usually more concerned about keeping their own child away from other sick children, rather than worried that other well children will catch their child’s illness. Our receptionists don’t want to police the waiting rooms. Colleagues with separate sick and well waiting rooms tell me that their receptionists spend at least part of each day helping parents decide which waiting room to sit in, moving patients from one waiting room to another, or settling angry squabbles between two families who are convinced the other’s child is in the “wrong” area. There’s no evidence separate sick and well waiting rooms make a difference in controlling the spread of infection. We believe that other commonsense precautions are more effective – like making masks, tissues, and hand sanitizer available in the waiting room; bringing children suspected of having an extremely contagious disease in through the back door; bringing extremely fragile/susceptible children back as soon as they enter the office. Why do I have to wait so long to see the doctor? Recently I had a frank conversation with a mom who told me “I have been dying to ask a doctor this question for years and I think you might be able to give me a reasonable answer, so here it goes: Why do I have to wait so long to see the doctor? Is there any good reason? A patient’s time is valuable too! 1. Unpredictability – When I walk into a room to see a child, I have no idea whether that child will have a minor illness or a major problem. Most kids are healthy, but when they are sick, they are often VERY sick. All it takes is one of these complex patients to completely disrupt a patient schedule. It is not like you can tell a family that you don’t have enough time to admit their child to the hospital today. 2. Seasonality – If you come in the middle of winter, there are going to be lots and lots of sick kids. We rarely, if ever, refuse to see a sick child on a same day basis. While we leave open many slots for same day calls, and are open until 9 pm every night, if it is winter, it will be busier and you may have to wait longer. If you come in the summer months, it seems every child in the universe needs a physical for camp or school. Certain laws and misguided insurance company policies make this problem even worse. If you can do your check up any other time, please do so. In summer it will be busy, and you do not want to be told that you cannot have your form filled out because we are completely booked up. We try to hire more doctors when we seem busier, but when the crunch time comes, we just have to get the job done. You don’t want your child to be ineligible for sports or miss the first day of school. 3. Human nature – This issue applies both to patients and doctors. Some doctors seem to think that it’s OK if they are late, but not if the patients are late. Your doctor should show up on time and start on time. But patients are subject to human nature as well. No one wants to take their child out of school or miss too much work, so I am often sitting around doing nothing from 1-3 pm while it is totally swamped from 3-5 pm. It is kind of like rush hour. If you don’t want rush hour traffic, try to drive some other time. It is always busier on Mondays and after school than any other times of the week. If you have an infant, don’t schedule your check up in the late afternoon for the reasons above. Our office does time and motion studies to try to figure out where the problem lies. We have discovered that a good part of the problem (assuming the doctor is arrives and starts on time) is patients coming 10 minutes early or 10 minutes late. That doesn’t seem like much, but it has enormous impact on the ability to see patients in a timely fashion. This will blow the schedule out of the water and disruption builds as the day goes on. Believe it or not, if everyone actually showed up on time both doctors and patients, things would be a great deal better for everyone. So, I ask all of you to try to understand. Running an office on time is better for patients and their doctors. Scheduling enough time to discuss the problem is critical. You cannot expect to have your child’s chronic stomachaches for the past 6 months be properly addressed in a same day sick visit. There is not enough time scheduled. A good doctor will make you come back and schedule enough time to evaluate your child properly. Most doctors hate running late as much as their patients do. If we all could try to understand the above issues and work together a bit better, we would all be much happier.